When summer is in full swing, SCUBA divers aren’t the only ones enjoying our warm local waters. This week, it seemed as if a diver out of every group stopped by the shop with a warning; the moon jellies are out! Summertime tends to be the peak of moon jellyfish season, but there are simple ways to avoid these stingy critters. Moon jellyfish are quite beautiful to observe in the water, translucent with a slight blue or pink tinge around the border of their body. They are easily identified by four horseshoe-shapes clustered in their center, and short gossamer-like tendrils that hang downwards. How do you know when to expect jellyfish? When planning your dives through a Force-E shop, ask us what you should anticipate encountering in the water. Our staff are out diving almost every day. We are a great resource to provide you with up-to-date dive conditions. If you are planning a shore dive, keep an eye out for a purple flag flying at the beach. This flag serves as a warning for “Dangerous Marine Life.” Before beginning your dive, check in with a local lifeguard and ask about marine life prominent to the area. Once you know what conditions to expect, you will know how to dress for success! One of the easiest ways to avoid jellyfish stings is to cover up. Wearing a full wetsuit offers great protection against stings or abrasions. A thinner 1 or 2 mm wetsuit will keep you covered without causing you to overheat when waters are warm. A beanie or a full hood keeps the top of your head protected, whereas a hooded vest offers coverage and extra insulation for your core. All of these are great accessories when diving a wreck or swim-through, where you are more likely to accidentally bump into or rub against your surroundings. Once you are under water, stay alert and aware of your surroundings. Odds are you will be looking around anyway to check in with your buddy or track your tank pressure and dive time. A quick scan of the area around you will help you stay with your dive group, and alert you to any approaching animals. You are most likely to encounter moon jellyfish in groups on or close to the surface. Be sure to look up occasionally during your safety stop, and when beginning your final ascent. If you notice a large group, or “bloom,” of jellyfish, swim a little bit away. Swimming through a bloom or pushing jellyfish aside with your hands are both likely to spread stingers in the water. Remember the old playground rule; keep your hands to yourself. If a bloom is above you when you are ready to ascend, you can swim a few meters towards shore before ascending, or just wait a minute or two to let them pass. Stop by your local Force-E to pick up sting-relief products before your next dive. After you surface, continue checking the water around you for approaching jellyfish. Of course, it’s important to keep your eyes on the dive boat as it approaches, but a quick glance into the water should be enough to warn you of incoming critters. Even with these tips, it’s best to have sting relief at the ready! 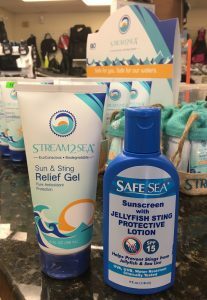 Force-E carries a number of products that work great to stop moon jellyfish, sea lice and sunburn from stinging and itching, so visit us to pick some up before your next dive. In a pinch, you can also rinse the sting with vinegar, or apply a baking-soda-sand-saltwater paste. Never rinse a jellyfish sting with freshwater or touch the area, as both can active additional stingers. If you are stung by a jellyfish and experience anything other than minor discomfort, see a doctor as soon as possible. Do you have any special tips or tricks to avoid or treat jellyfish stings? Comment to share!